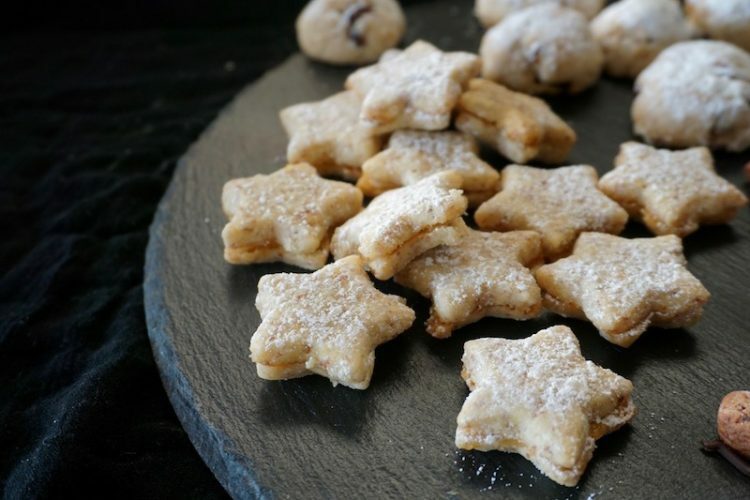 And we continue with recipes for Christmas cookies! These here I call orange-almond-stars, because (and now brace yourself for a really good explanation) I only cut out stars. You may rename them according to the cookie cutter you use. I chose just a single one, so that I do not have to worry while sticking them together with jam. There will always be an even number of stars to work with and I don’t have to keep separate stacks. Here on the blog, I wrote down the recipe without marzipan. If you want to, you could place a thin marzipan star between the cookies. It will become a bit sweeter and the almond taste is more pronounced. To do so, roll out about 50 g of marzipan to a very, very thin layer between sheets of plastic foil and use your cookie cutter. If the marzipan starts to stick to it, washing it helps (the cutter, not the marzipan). And one more great thing: yes, these are vegan! Have lots of fun with your Christmas baking! Whip 200 g soft butter, 75 g powdered sugar, 4 tbsp fine white sugar, zest and 1 tbsp of the juice 1 orange and 1 pinch of salt until creamy. Sift 120 g ground almonds, 150 g flour and 50 g starch over the butter-sugar-mix. Only mix until a consistent dough forms. Separate into 2 portions, wrap them in foil and chill them in the fridge for at least 30 minutes. Preheat the oven to 355° F (180° C, upper- and lower heat). Prepare baking trays with baking parchment. Roll the dough out on a floured work surface to a 4 mm thickness and cut out cookies. Keep the dough cool, alternating work with the portions to prevent excess sticking to the surface (it helps to cool it down in the freezer). Bake the cookies on each tray individually for 7 minutes at 355° F (180° C, upper- and lower heat). Let them cool on a roast. As soon as they all have cooled cover your work surface with foil. Warm 4 tbsp of orange jam shortly in the microwave (so it is easier to spread). Spread one cookie with jam and place another cookie on top. Dust all stacked cookies with powdered sugar. Keep well till after Christmas in a tightly closed, cool stored tin.